A psychotic powerful archer and assassin barely in her teen years. She has either Christian or Catholic beliefs and believes Shiba-I to be the Madonna and worships her unquestioningly. She was raped by her father as a child, but she killed him in self-defense. She spent her early school life being abused mostly by most of the other children. She learned how to fight, kill, and play the guitar from Shiba-I, whom she adores. 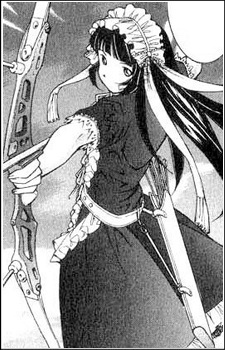 She tried to assassinate Ryomou and retrieve the Gyokuji but Ryomou's dragon woke up and ripped off her right arm, nearly killing her during the process. She is currently in a coma. She possessed a Hyakuhekitou called the 100-Swing Blade Dragon hidden inside an electric guitar. The same as the manga, except she did not have a Hyakuhekitou. She did not lose her arm to Ryomou during their fight but was still horribly injured in the fight. Instead of fighting Kouchu in the anime, she fights Chou-un instead. At the end of the series we see her fully recovered and tending to horses with Chouryo. After the events of Dragon Destiny, Ten'i became obsessed with finding Shiba-I after her disappearance, going as great lengths seemingly in vain which caused her to rampage where as she almost killed Ryoumu and Chou'un when she though she had sensed Shiba-I.